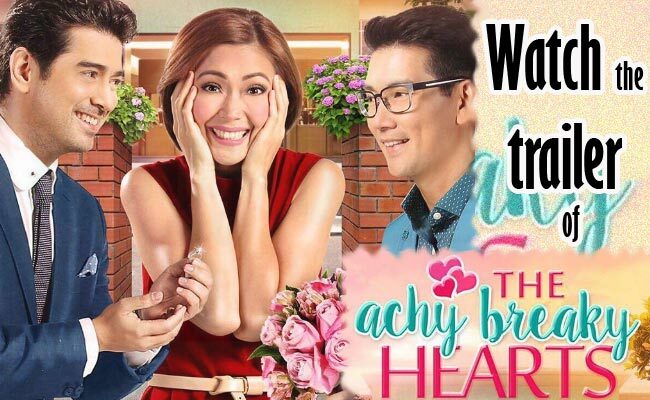 Star Cinema revealed a teaser trailer from the much anticipated romantic comedy movie “The Achy Breaky Hearts” starring Jodi Sta. Maria, Ian Veneracion and Richard Yap. It was first released to Star Cinema’s mother station, ABS-CBN during a commercial break last June 5 and their fans are very excited to watch it on the big screen. The trailer was then uploaded on star cinema’s official youtube account and as of this typing, it now has 121, 346 views. It will be the first time that the three stars will work together on a movie as Jodi and Richard first had a hit tv show “Be Careful With My Heart” that lasted for more than 2 years where they were known as Maya and Sir Chief. Jodi and Ian on the other hand also had great chemistry through the show “Pangako Sa Yo” where they played Amor Powers and Ricardo Buenavista. Their fans were also divided on who has the better chemistry, there were “Team Tisoy” and “Team Chinoy”. On the trailer Jodi plays a middle age single woman whose friends and family were encouraging her to find a man and get married but the problem is, it was still not on her priority. Even her grandmother is also telling her to seek for a guy whom she will marry then Jodi jokingly said that she will be a flower girl at her wedding then her grandmother replied if she is still alive if that will happen then one day, her grandmother died. On the next scene, Jodi’s character was accompanied by Ian’s character where they were seen on a car and movie theater. Richard’s character also appeared where he plays Jodi’s former flame. Her friends asked her who will she choose between the two and she playfully answered if she can choose both. Achy Breaky Hearts will show soon in the big screen on June 29 directed by Antoinette Jadaone who is known her hugot movies like “ That Thing Called Tadhana” and “All You Need is Pag-ibig”. She also directed the hit tv show “On The Wings Of Love”.